Paramount Books Dates for Two More Terminators! Hey, we have some Terminator news! It's not about Terminator Genisys, per se, but rather its two additional sequels. Sequels, you say? Yes! We knew a trilogy was part of the plan from the outset, but now Paramount has announced (as reported by THR) planned dates to release "Terminator 2" and "Terminator 3," on May 19, 2017 and June 29, 2018 respectively. At last, the radio silence from the new Terminator film has ended! After several days of filming happening in downtown San Fransisco, with crowds gathered to watch, Arnold himself broke the news that filming has wrapped(at least his part). He posted the following image and message to his Twitter and Instagram accounts, which give us a tease of his look AND.... finally an official title. Terminator: Danny Dyson Takes Down Cyberdyne... with Weird Al! 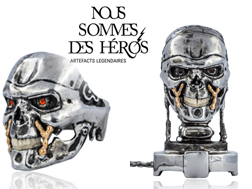 Terminator: There is No Title Yet! Ever since the round of leaked photos from on and near the set of the new Terminator movie, it seems that measures have been taken to clamp down on security and secrecy, as very little has come out of New Orleans lately. While that unfortunately means I haven't had much to post about here, I'm actually happier that we're not seeing too much information leaked, since even little things like seeing which characters are in a scene together and makeup effects can be spoiler-ish. Terminator Roundup! A Truck, A Logo, and A Cast Interview! OK, cyborgs and cyborgettes- here's the latest news straight from Skynet! A couple of days ago, Arnold posted a photo of himself on Facebook/Twitter wearing a USA soccer shirt in support of the World Cup team. Arnold looks cool as always, but in the background of the photo is part of a huge looking truck of some sort. EXCLUSIVE Terminator Audition Footage & Evander Visits Arnold! New Pics of Arnold with Terminator Facial Damage! The world can't wait for a new Terminator with Arnold in it as evidenced by the internet exploding with each new spy shot of the Oak around the set! These latest ones seem to show him during a stogie break outside in partial costume and makeup. 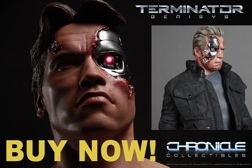 He clearly has some gashes on his face, so the T-800 has gotten in on some action, but not too much since there's not yet any endoskeleton visible. More Terminator Talk- Cameron's 2 Cents! Let's catch up on more Terminator in the news! First, to be clear, no official title has been announced, and the studio has not decided on one as of yet. It COULD end up being "Genesis" as a script draft was titled and most of the internet has been referring to it as such, but it could easily change to something else, so we are just referring to it as "Terminator" until we get official word. First Pics of Arnold On Set in Terminator! Alright, it's again time for the Gillinator to come out from behind the website curtain and start a new Terminator Report series! Why is that? Well, unless you are new to TheArnoldFans or have been living in a nuclear fallout bunker like John Connor and Kate Brewster at the end of T3, you know that a new Terminator movie is under way!